Why we are always taking the easy way - and why this may be quite hard sometimes.. The way of least resistance has always been a very intriguing concept to me. Without being a psychologist or a professional, I’d like to share some thoughts on the matter from the yogic point of view. If you consult spiritual literature on the way of least resistance, you will find some quite blatant contradictions, at least on the surface. If we follow our inner truth, do we have to fight for it? Can we even overcome our inner and outer hindrances if we always follow the "easy way"? Things become a little bit clearer if we remind ourselves that "easy" and "difficult" are merely constructions of our thinking mind, created by comparing reality to an imagined flow of events, constructed out of memories of seemingly comparable situations. Maybe we even compare two such imaginary situations with each other. Reality, on the other hand, just is. As it is. Now. 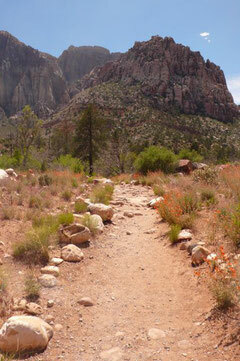 So there actually is no easy and no hard way - just the path we are taking, the Way we are, the Life we are. On a purely practical level however, we often note that in order to pursue our goals successfully, we need to say "no" to a number of things that would seem to deter us from our purpose. Wouldn't the easy way be, then, to just give in to the impulses of habit, of convenience or of doubt? If we analyze this a little bit further, it turns out that giving in or not giving in is to some extent determined by the path of least resistance as well. Least resistance to what, then, and what is resistance anyway? Those are very interesting questions. 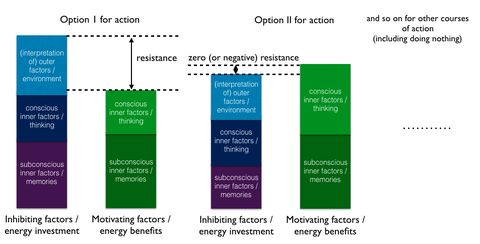 By resistance here I mean the differential between motivating and inhibiting factors concerning a certain course of action, a decision to be made. Most obvious are outer inhibitors, people who tell us "don't do that ", solutions that have to be found for something to work, commitments, liabilities, and so on. Inner inhibitors may include fear of change, laziness, or a limiting inner belief system. All of this may look a bit mechanistic at first glance. Especially the inner inhibitors and motivators could be seen as largely predetermined by our previous experience and our character - there is no way out, and anybody who knows the entire system would be able to predict exactly what you will decide, for in the end all of this is internally stored content, we could say memories in the broadest sense of the word. There are philosophers who think so. Personally, I would find this a bit limiting. Thinking about the way of least resistance therefore implies also thinking about free will, another interesting philosophical topic. The Hawaiian way of peace Ho'oponopono offers a - to my mind - very helpful way to look at this. According to this view, among others documented in Joe Vitales book "zero limits", our thoughts stem either from inspiration or from memory - stemming from the individual or collective subconscious. By meditation, yoga nidra and other practices we can get better at recognizing the difference between those kinds of inputs into our conscious mind, which makes it easier to decide where to 'go with the flow', and where it would be advisable to say no to a thought and wait for the next one before acting. Therefore, mathematically put, resistance towards a certain course of action is the sum of all inhibitors less the sum of all motivators. Seen in this way, we'll always follow the path of least resistance, we cannot help it. Because the sum total of all factors we use to decide between options for action already are part of what makes up the resistance. This process is partly conscious, but mostly unconscious. And it goes even farther: seen in this way, we actually follow only the path of zero (total) resistance, because without the sum total of motivators being higher than that of the inhibitors, there will be no action. Which is an action as well, of course. We can therefore say, the concept of overcoming resistance is valid only when we limit our view to the field of outer and conscious inner inhibitors and forget the motivators and the whole field of the subconscious. So, to summarize: the real question in deciding what to do is not about deciding if it's worth to invest enough energy to overcome some outer or inner resistance to success, but to analyze and work with both motivators and inhibitors. Simply put, to get to know our innermost needs and wishes better, see them more clearly - for instance through meditation, yoga nidra or philosophical introspection. Seeing our needs clearly will automatically raise your level of inner (conscious and subconscious) motivation - and the way to best fulfill our needs will automatically become the path of least resistance! Knowing what you want and then really letting go helps achieving it faster, more easily and - interestingly - with less outward friction. Or as we say in the practice of Ho'oponopono: Thank you, God, for always providing the best solution for everybody concerned. Why is this so? Because when we let go and trust in the wisdom of our highest Self, our subconscious is free to tap into the web (= Tantra) of universal consciousness to truly create solutions that benefit not only yourself but also the world around you. 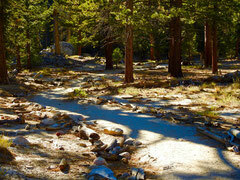 And your very own path of least resistance may shine in all its glory to the benefit of all beings you meet. If you are a practitioner of Yoga Nidra, I suggest you think of this when creating or changing your sankalpa. I hope, this little compilation of thoughts is of help and may offer a new perspective for some. Thank you. I enjoy what you guys tend to be up too. This kind of clever work and exposure! Keep up the great works guys I've added you guys to my blogroll. Howdy! I just would like to offer you a huge thumbs up for the great info you have got right here on this post. I am returning to your web site for more soon. Neue Termine für 2019 in der Schweiz und Deutschland sind da - am besten gleich anmelden ! Now available: Andreas' new book, ON HOW TO BECOME YOUR OWN GURU. Find it on amazon and in your bookstore! 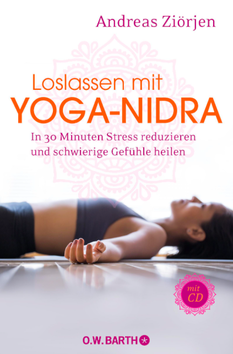 Loslassen mit Yoga-Nidra - in 30 Minuten Stress reduzieren und schwierige Gefühle heilen. Ein Übungs- und Philosophiebuch mit CD und drei Yoga-Nidra-Übungen von Andreas Ziörjen, im O.W. Barth-Verlag. Yoga-Nidra-Spezialist Andreas Ziörjen eröffnet eine neue Dimension für den „yogischen Schlaf“. Wissenschaftlich fundiert erklärt er, wie man mit der bekannten Tiefenentspannungs-Übung negative Emotionen heilen kann. 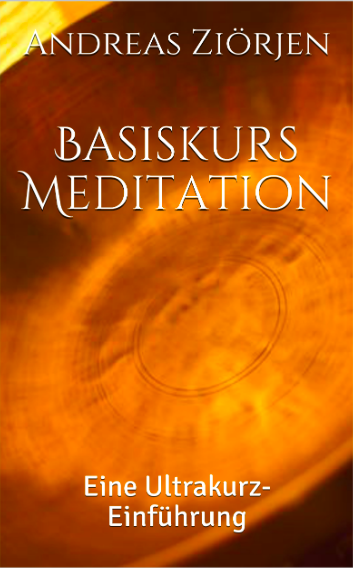 Regelmäßig geübt, führt diese nachhaltige Meditations-Methode zu einer effektiven Bewältigung von Stress-Situationen. Yoga-Nidra ist einfache Meditationstechnik, die im Liegen durchgeführt wird und sich hervorragend zum Stressabbau eignet. In einer Art Zwischenzustand zwischen Wachen und Schlafen können wir mal zwischendurch im aufreibenden Alltag komplett „runterfahren“ und zur Ruhe kommen. Auch für Ungeübte ist Yoga-Nidra sehr leicht erlernbar und die erfrischenden, entspannenden und klärenden Wirkungen sind schon nach kurzer Zeit spürbar. Beim Umgang mit belastenden Emotionen wie Wut und Ärger lernen wir, deren energetischen Verlauf im Körper genau zu spüren und aufzulösen. Denn häufig empfinden wir Gefühle nicht „zu Ende“ und behalten eine negative Ladung in unserem inneren System. Außerdem erfahren wir, wie wir mit einer einzigen klar formulierten Absicht, einem sogenannten Sankalpa, auf die Dauer unser Leben positiv verändern können.